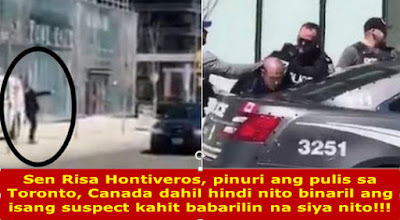 Senator Risa Hontiveros praised a police officer in Toronto, Canada who refused to shoot at a van attack suspect, despite the fact that the latter provoked the cop to shoot him. The suspect killed 10 people and wounded 15 others when he hit a van into a crowd of pedestrians on Monday, April 23. He was arrested around 25 minutes later. According to CBC.ca in Canada, local police identified the suspect as Alek Minassian, a 25-year old “socially awkward” student from Richmond Hill, Ontario, but has no previous police records. He reportedly rented a white Ryder van and deliberately drove it into the sidewalk at Yonge Street between Finch Avenue and Sheppard Avenue, in Toronto. Shortly after the attack, Minassian tried to escape using the van but the police was able to corner him. In the video, the suspect can be seen taking something (which was believed to be a gun) from his side and pointed it to the police in front of him, and shouted, “Kill me. However, the policeman did not shoot him despite being provoked. Instead, the police ordered Alek Minassian to get down on the ground as they moved in to arrest him. The Toronto Police Service did not mention the name of the cop who refused to shoot the suspect, but was described as a "very seasoned and mature officer." As of posting, the motive was not yet clear and is still under investigation. Meanwhile, tons of netizens admired the policeman for the maximum tolerance he showed in the middle of such crisis. The untoward incident was also reported in Philippine news, with some personalities and politicians reacting on the incident. This includes Sen. Risa Hontiveros, who praised the cop for not shooting at the suspect. “Nakakalungkot na may mga pangyayaring ganito. Ganunpaman, kasama ako sa mga pumupuri sa kanilang alagad ng batas, na kahit pino-provoke na, mas pinili nyang pasukuin na lang yung suspect. Alam kong kaya din yan gawin ng kapulisan natin, kaso iba ang takbo ng utak ng pangulo natin.” Hontiveros said in an ambush interview.